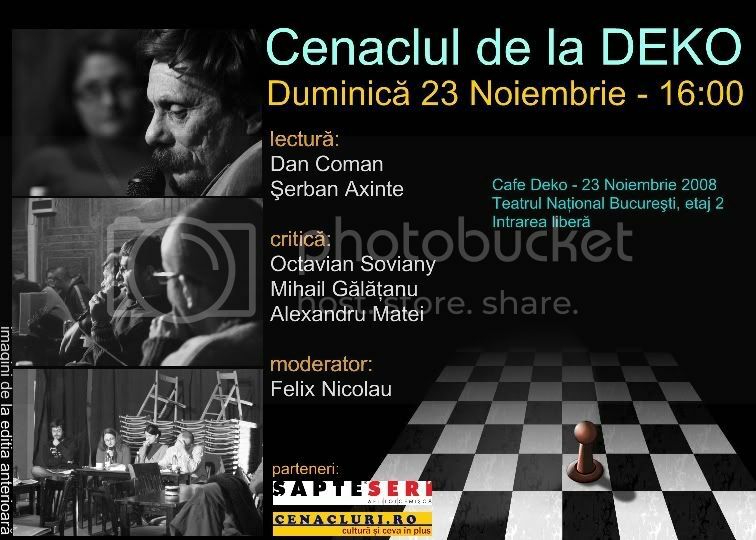 The Deko literary circle keeps the flag up in the period of the Gaudeamus book fair as well, benefiting from the presence of many writers and cultivated men in Bucharest, to organize a literary circle with a „heavy” poster and a special presence. Targeted by the critics: Octavian Soviany, Mihail Gălățanu and Alexandru Matei on Sunday, November 23rd 2008, starting at 4 PM, the next writers will be: Dan Coman and Şerban Axinte. The chairman of this meeting will be Felix Nicolau. We invite you to take advantage of this occasion to meet once more with Deko’s Literary Circle. After Sunday the meeting will be paused for almost two weeks, while the Deko Cafe will move to a new location.